From the makers of Walking With Dinosaurs comes an epic and entertaining new exploration of early life on Earth, revealing that before the age dinosaurs, a succession of fantastical animals and plants ruled the planet. Using state of the art visual effects, Walking With Monsters recreates a time when a two-ton predatory fish came on land to hunt, when four-metre sea scorpions sliced sushi in the shallows and when just one species of lumbering reptile represented 80 per cent of all life. For the first time, this special two-hour presentation uncovers and recreates these creatures and the bizarre world they inhabited. 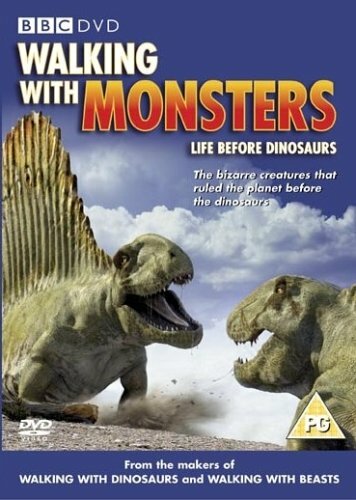 Drawing on the knowledge of more than 600 scientists, state-of-the-art technology and animation, this special spans more than five million years and brings to life the weird, wonderful and sometimes terrifying creatures that roamed before the dinosaurs with amazing realism. Using real footage plus innovative morphing technology, this special goes inside the body of our monster ancestors for the first time to learn what creature gave humanity our very first limb, our heart and even our brain. Witness the struggle for the fittest as it has never been seen before - a war between animals more strange, savage and successful than any dinosaur that would follow.